Gunther-Harrington CT, Michel AO, Stern JA. Acquired tricuspid valve stenosis due to intentionally redundant transvenous lead placement for VDD pacing in two small dogs // J Vet Cardiol. 2015 Dec;17(4):298-303. 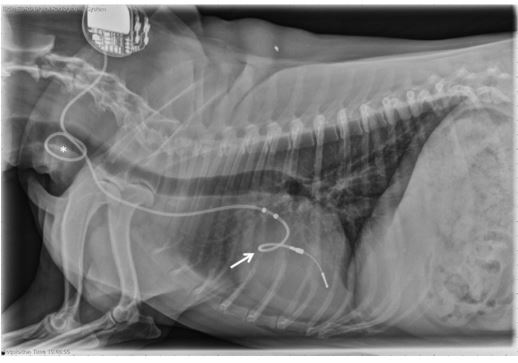 Placement of an endocardial VDD pacing lead in small dogs (<12 kg) may necessitate a redundant lead remaining looped in the right atrium for appropriate sensing and pacing. This report documented acquired tricuspid valve stenosis in two small dogs between 8 months and 4 years after VDD pacemaker placement for third-degree atrioventricular block. Echocardiography and Doppler echocardiography identified elevated transtricuspid flow velocities, prolonged pressure half-times, decreased valve leaflet excursions, and tricuspid regurgitation in both cases. Both cases were euthanized secondary to this pacing complication. Necropsy was performed in one case and confirmed adherence between the redundant lead loop, atrial and valve tissue. While VDD pacing in dogs has proven hemodynamic benefits, these benefits have not been demonstrated in terms of survival benefit or clinical signs. The requirement of redundant lead placement in small dogs for appropriate VDD lead function creates potential deleterious effects that should be weighed against the possible clinical value of VDD pacingin these patients. A 12 year-old male, castrated, 11.6 kg West Highland White Terrier was referred to the University of California (UC), Davis Veterinary Medical Teaching Hospital (VMTH) for re-evaluation 3 years and 9 months after VDD pacemaker placement. In October 2010, a CapSureVDD-2 (Model 5038S)1 52 cm, 11.5 cm A-V distance, passive-fixation, bipolar lead was placed at the same institution for management of third-degree atrioventricular block (3AVB) without reported complications. The dog had no significant medical history, and at intermittent rechecks his pulse generator was pacing and sensing appropriately. No echocardio- graphic or radiographic reevaluations were performed during this 3 year and 9 months interval. The dog was reported to be progressively more lethargic over the previous 3—4 months; however, no episodes of fainting or collapse were noted. The dog had a single episode of vomiting 2 days prior to presentation, and was presented to the family veterinarian for further evaluation. On physical exam, his pulse rate was 60 bpm and there were no other recorded significant findings. A complete blood count, serum biochemistry, and urinalysis were performed. Complete blood count was consistent with a moderate, macrocytic, normochromic, poorly regenerative anemia with meta- rubricytosis [Hct 23% (ref 36—60%); MCV 83 fL (ref 65—75 fL); nRBCs 3/100 WBCs (ref 0/100-0/100 WBCs)]; there was a normal leukocyte count with a mild lymphopenia (485/uL, ref 1000—4000/uL) and absolute monocytosis (1358/uL, ref 150-1200/uL). Moderate thrombocytopenia (84,000/uL, ref 150,000—400,000/uL) was also present. Serum biochemistry showed hypoalbuminemia (1.7 g/dL, ref 2.7—4.4 g/dL) and mild alkaline phosphatase elevation (294 IU/L, ref 5—131 IU/L). Urinalysis was unremarkable. The dog was referred to the Cardiology Service at UC Davis VMTH for further evaluation. Upon presentation, the dog had pale mucous membranes and a heart rate of 120 bpm. There was a grade II/VI left apical systolic murmur and a grade I/VI right apical systolic and diastolic murmur noted. Hepatomegaly was appreciated, as was mild cervical subcutaneous edema. Pacemaker interrogation revealed appropriate pacing and sensing, with the exception of instances of noise reversion. To address noise reversion, the ventricular refractory period was decreased from 330 ms to 270 ms.
Echocardiography showed decreased excursion of the septal leaflet of the tricuspid valve and close proximity of the adjacent transvenous pacing lead (Video 1). This finding generated concern that the tricuspid valve leaflet may have been entrapped by the pacing lead. The valve leaflets were hyperechoic, with marked thickening and marked decreased diastolic excursions. 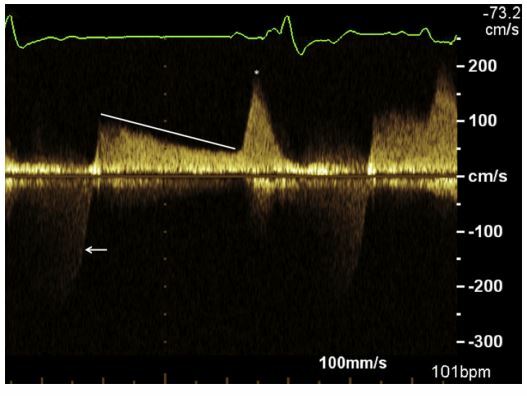 The spectral Doppler profile was consistent with severe tricuspid valve stenosis (Fig. 1), with increased transtricuspid flow velocities (E-wave velocity = 1.01 m/s, A-wave velocity = 1.97 m/s), and the E—F slope was decreased, which was consistent with prolonged deceleration of early diastolic right ventricular filling.1 Mean transtricuspid pressure gradient was increased at 5.53 mmHg [>5 mmHg in humans is indicative of severe tricuspid valve stenosis (TVS)] with a maximal velocity of 1.97 m/s after atrial systole (normal <1.00 m/s).2 Pressure half-time (PHT) was increased (200 ms [normal <50 ms]).1 There was mild tricuspid regurgitation on color Doppler assessment, with a subjectively dilated right atrium. The thoracic radiographs featured in Figure 2 revealed that the lead, which was similarly positioned as seen at the time of implantation, and the tip of the lead appropriately terminated in the region of the right ventricle. Hematology and serum biochemistry were consistent with acute inflammation, characterized by lymphopenia (256/ uL; ref 1000—4000/uL), monocytosis (1280/uL; ref 150-1200/uL) and presence of nucleated red blood cells (6/100 WBCs; ref 0/100-0/100 WBCs). Progressive thrombocytopenia (platelets 52,000/uL; ref 170,000—400,000/uL) was observed. The Idexx 4Dx SNAP test was negative for heartworm antigen, Anaplasma phagocytophilum antibodies, Anaplasma platys antibodies, Borrelia burgdorferi antibodies, Ehrlichia canis antibodies, and Ehrlichia ewingii antibodies. Urinalysis, serum troponin concentration, blood cultures, urine cultures, and resting cortisol were all within normal limits. Abdominal ultrasound was consistent with rightsided congestive heart failure (CHF); enlarged, hyperechoic liver, dilated hepatic veins, and mild anechoic effusion were noted. The pacemaker lower rate was increased from 60 ppm to 80 ppm to add cardiovascular support. The dog was hospitalized for 3 days, treated for right-sided CHF with furosemide 12.5 mg PO q 12 h, pimobendan 7.5 mg PO initially q 12 h but increased to q 8 h due to progressive edema, and broad-spectrum IV antibiotics (enrofloxacin 110 mg IV q 24 h, ampi- cillin—sulbactam 580 mg IV q 8 h) due to concern for infectious endocarditis (IE) and sepsis, although this diagnosis was later rejected based on the absence of sufficient IE criteria.3 Hematology values and serum chemistry values stabilized, and the dog was discharged to the owners with oral medications. Recheck examination 1 week later indicated well-controlled right-sided CHF with improved thrombocytopenia (84,000/uL, ref 170,000—400,000/uL). The dog clinically declined over the following months and was euthanized by the family veterinarian 9 weeks after the diagnosis of acquired tricuspid valve stenosis. The owners declined post-mortem examination. The tracing shows a prolonged deceleration of early diastolic right ventricular filling (white line) and an elevated velocity (asterisk) after atrial contraction consistent with tricuspid valve stenosis. There is also evidence of tricuspid regurgitation as evidenced by systolic flow away from the transducer (arrow). Figure 2 Right lateral thoracic radiograph obtained from Case 1 almost 4 years after pacemaker implantation, demonstrating placement of redundant lead forming a loop within the right atrium (arrow) at the level of the tricuspid valve. An additional loop of redundant lead is seen in the neck (asterisk). A 14 year-old male, castrated, 6.3 kg, Jack Russell Terrier was presented to the UC Davis VMTH for lethargy and ventral neck swelling. A VDD Medtronic, Model #5038Sc, bipolar, passive-fixation VDD lead with an 11.5 cm A—V distance was placed 10 months before, at the same institution, for management of 3AVB. The owners of the dog noted progressive neck swelling, which began a week prior to presentation, and the dog had become lethargic with intermittent agitation. On physical examination there was an area associated with the right ventral neck, which was presumed to be subcutaneous edema. A grade IV/VI right apical systolic murmur was noted, with a heart rate of 150 bpm. Biochemistry panel revealed a mild azotemia and hypoalbuminemia [BUN 46 mg/ dL (ref 11—33 mg/dL), Creatinine 1.7 mg/dL (ref 0.8—1.5 mg/dL), Albumin 3.1 g/dL (ref 3.4—4.3 g/ dL)] with no other significant findings. Thoracic radiographs revealed a small volume of pleural effusion and evidence of peritoneal effusion. The cardiac silhouette exhibited moderate and progressive generalized enlargement, with prominent convexity to the right side when compared with radiographs obtained at the time of pacemaker implantation. The pacemaker lead appeared to make a tight loop within the right atrium at the level of the tricuspid valve, with the tip of the lead terminating at the level of the right ventricular apex (Fig. 3). Echocardiography revealed right atrial and ventricular dilation, with the pacemaker lead adhered to the septal leaflet of the tricuspid valve. This leaflet had minimal diastolic excursion that moved in conjunction with the adjacent region of the pacing lead. Color Doppler assessment revealed turbulence across the valve in systole and diastole, which was consistent with tricuspid insufficiency and stenosis (Video 2). Spectral Doppler transtricuspid flow profile revealed increased A-wave velocities, with a maximal velocity of 1.22 m/s (Fig. 4). The tricuspid mean pressure gradient was increased at 5.3 mmHg (normal in humans <5 mmHg).2 The PHT was prolonged, with a value of 132 ms (normal <50 ms).1 Mild anechoic pericardial, pleural, and peritoneal effusion was also noted. A diagnosis of acquired TVS with resultant right-sided CHF was made. The treatments that were initiated included: furosemide 12.5 mg PO q 12 h, spironolactone 6.25 mg PO q 24 h, pimobendan 2.5 mg PO q 12 h, and enalapril 2.5 mg PO q 12 h. The dog’s clinical signs were medically managed for 3 weeks prior to clinical decline, at which time the owners elected for euthanasia. Gross necropsy findings included adherence of the pacemaker lead to the septal leaflet of the tricuspid valve as well as to the atrial myocardium. (Fig. 5) Histologic assessment of the tricuspid valve showed extensive fibrosis of the septal leaflet of the tricuspid valve in the immediate region of lead adherence. Myxomatous change was found in all leaflets. However, in the septal leaflet at the level of the observed adherence, the fibrosis was judged to be severe with extensive expansion of the spongiosa layer and early chondroid metaplasia; there was no evidence of infection. Redundant, looped lead is present within the right atrium (arrow). 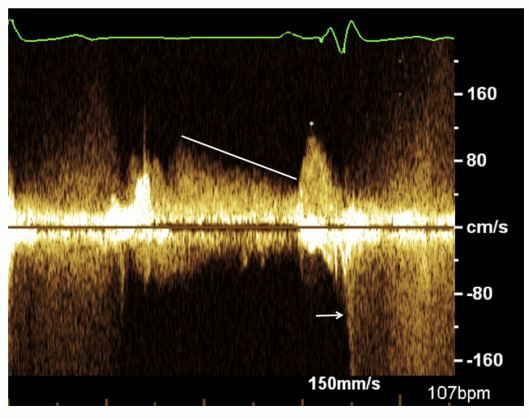 Figure 4 Continuous wave Doppler interrogation of the transtricuspid flow velocities from Case 2, using a left apical four-chamber view. The tracing reveals increased A-wave velocities with a maximum velocity of 1.22 m/s (asterisk) and prolonged E-wave deceleration (line). There is also evidence of tricuspid regurgitation, as evidenced by systolic flow away from the transducer (arrow). Figure 5 Gross pathology specimen obtained from Case 2. The heart has been opened through the right ventricular inflow tract, showing diffusely thickened tricuspid valve leaflets (arrowheads). At the time of examination, adherence of the endocardial pacing lead to the right atrial wall and septal leaflet of the tricuspid valve were confirmed. The right atrial site of adherence is visible in this image as the atrial tissue remains encircling the pacing lead (asterisk). Adherence of the septal leaflet of the tricuspid valve to the pacing lead is visible where the lead crosses the valve into the right ventricle (arrow). The distal tip of the pacing lead is fixed to the endocardium of the right ventricular apex. Right atrial dilation is observed. A 2-cm scale bar with 1mm intervals is provided for size reference. 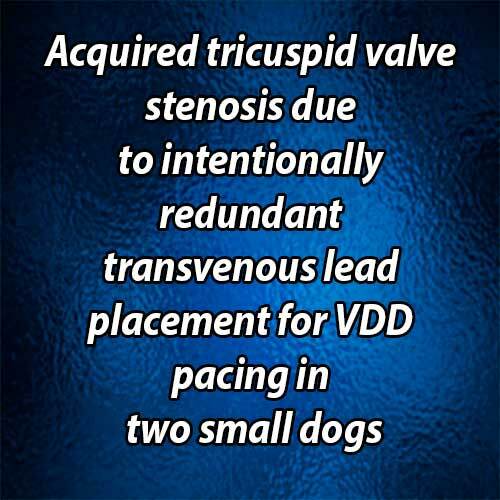 This report described acquired tricuspid valve stenosis that ensued in two dogs after transvenous VDD pacemaker lead placement and was thus most likely secondary to intentionally redundant lead used for this procedure. 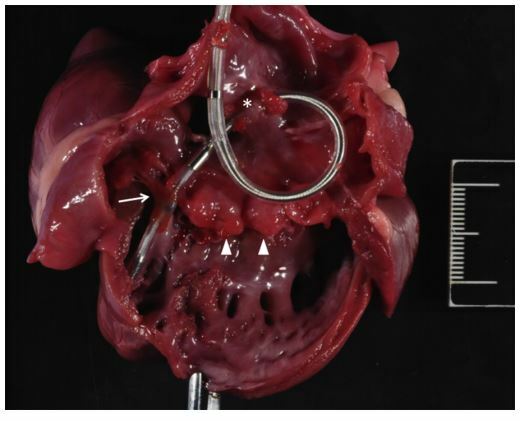 Tricuspid valve stenosis is an uncommon complication of transvenous pacemaker lead placement in dogs, with few cases reported in the literature. There is a single reported case of TVS secondary to lead placement in a young dog4; however, this was not a reported complication in previous comprehensive reviews of pacemaker placement in dogs.5-7 Additionally, TVS was not a reported complication in a study of VDD transvenous pacing in 19 dogs may be because of the low number of VDD pacemakers placed with VDD leads included in previous investigations and the absence of small dogs in the largest report of VDD transvenous pacing. Although VDD pacing may be accomplished through the use of two transvenous leads, the use of a transvenous VDD lead requires lead redundancy in small dogs. While any transvenous pacing system with excessive atrial redundancy may lead to TVS, atrial lead redundancy is unnecessary in non-VDD transvenous pacing systems for small dogs. Acquired tricuspid valve stenosis has been reported as a complication of transvenous pacemaker placement in humans.15-18 The stenosis may be secondary to perforation or laceration of the valve leaflets during placement, endocarditis, or adherence between redundant lead and valve tissue.15-18 In the first case reported here, endocarditis was initially suspected, although a diagnosis of such was not confirmed. It is thought that the lead entrapment created a substrate for endothelial damage and subsequent inflammation, although primary tricuspid endocarditis leading to stenosis cannot entirely be ruled out. In the second case, no evidence of valve perforation or endocarditis was noted. It is possible that, as documented in one dog and multiple human reports, excessive lead left in the right side of the heart places dogs at risk of acquired TVS. The requirement of redundant lead placement in small breed dogs in particular, for appropriate VDD lead function, creates potential deleterious effects. The risk of a redundant pacing lead causing tricuspid valve stenosis is not unique to VDD leads, and is one of the reasons why other lead systems are typically placed with care to avoid lead redundancy. These case reports suggest that the right atrial loop technique for VDD lead placement should be avoided - particularly in small dogs (<12 kg bodyweight). Oyama MA, Weidman JA, Cole SG. Calculations of pressure half-time. J Vet Cardiol 2008;10:57-60. Boon JA. Stenotic lesions. In: Veterinary echocardiography. 2nd ed. West Sussex, UK: Wiley-Blackwell; 2011. p. 477-525. MacDonald K. Infective endocarditis in dogs: diagnosis and therapy. Vet Clin North Am Small Anim Pract 2010;40: 665-684. Connolly DJ, Neiger-AeschbacherG, Brockman DJ. Tricuspid valve stenosis caused by fibrous adhesions to an endocardial pacemaker lead in a dog. J Vet Cardiol 2007;9:123-128. 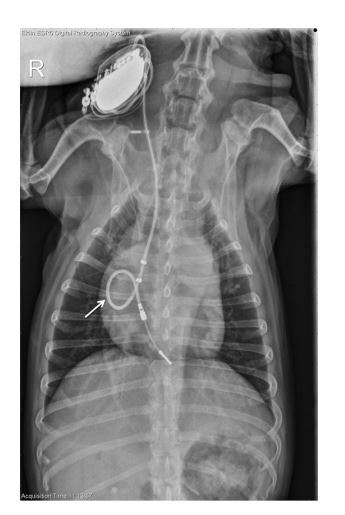 Johnson MS, Martin MWS, Henley W. Results of pacemaker implantation in 104 dogs. J Small Anim Pract 2007;48: 4-11. Oyama MA, Sisson DD, Lehmkuhl LB. Practice and outcome of artificial cardiac pacing in 151 dogs. J Vet Intern Med 2001;15:229-239. Wess G, Thomas WP, Berger DM, Kittleson MD. Applications, complications and outcomes of transvenous pacemaker implantation in 105 dogs (1997-2002). J Vet Intern Med 2006;20:877-884. Lichtenberger J, Scollan KF, Bulmer BJ, Sisson DD. Longterm outcome of physiologic VDD pacing versus nonphysiologic VVI pacing in dogs with high-grade atrioventricular block. J Vet Cardiol 2015;17(1):42-53. http://dx. doi.org/10.1016/j.jvc.2014.12.004. Bulmer BJ, Sisson DD, Oyama MA, Solter PF, Grimm KA, Lamont L. Physiologic VDD versus nonphysiologic VVI pacing in canine 3rd-degree atrioventricular block. J Vet Intern Med 2006;20:257-271. Cabello JB, Bordes P, Mauri M, Valle M, Quiles JA. Acute and chronic changes in atrial natriuretic factor induced by ventricular pacing: a self controlled clinical trial. Pacing Clin Electrophysiol 1996;19:815-821. Nowak B, Voigtlander T, Himmrich E, Liebrich A, Poschmann G, Epperlein S, Treese N, Meyer J. Cardiac output in single-lead VDD pacing versus rate-matched VVIR pacing. Am J Cardiol 1995;75:904-907. Sulke N, Dritsas A, Bostock J, Wells A, Morris R, Sowton E. "Subclinical” pacemaker syndrome: a randomized study of symptom free patients with ventricular demand (VVI) pacemakers upgraded to dual chamber devices. Br Heart J 1992;67:57-64. Bulmer BJ. VDD pacing in dogs: when, why and how to perform single-lead atrial synchronous, ventricular inhibited (VDD) pacing. J Vet Cardiol 2006;8:25-39. Bulmer BJ, Oyama MA, Lamont LA, Sisson DD. Implantation of a single-lead atrioventricular synchronous (VDD) pacemaker in a dog with naturally occurring 3rd-degree atrioventricular block. J Vet Intern Med 2002;16:197-200. Old WD, Paulsen W, Lewis SA, Nixon JV. Pacemaker lead- induced tricuspid stenosis: diagnosis by Doppler echocardiography. Am Heart J 1989;117:1165-1167. Taira K, Suzuki A, Fujino A, WatanabeT, Ogyu A, Ashikawa K. Tricuspid valve stenosis related to subvalvular adhesions of pacemaker lead: a case report. J Cardiol 2006;47:301-306. Heaven DJ, Henein MY, Sutton R. Pacemaker lead related tricuspid stenosis: a report of two cases. Heart 2000;83: 351-352. Ribeiro H, Magalhaes P, Ferreira C, Baptista A, Margato R, Carvalho S, Rosa P, Mateus P, Ferreira A, Moreira JI. Pacemaker lead-induced tricuspid stenosis: a report of two cases. Rev Port Cardiol 2012;31:305-308.